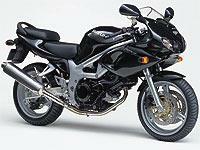 The SV650 twin is being updated with the addition of adjustable front suspension. The change is being made in both naked and the faired " S " version. Both already 41mm forks – the alteration gives them adjustment for pre-load. Otherwise, the SV remains unaltered. Prices have yet to be announced, but they’re unlikely to be significantly higher than today’s bike, which sells for around £4500 in unfaired form, and £4800 with bodywork. See how much less you could pay. Check Bikemart (accessed through the top navigation bar).